1 Transcript entry that is made up of timespan, content and speaker. You can have multiple transcript entries with the same timespan—for example, you could have one entry for dialog and another for body language. 3 Content column (field) contains the transcript text. You can code the text in this column. 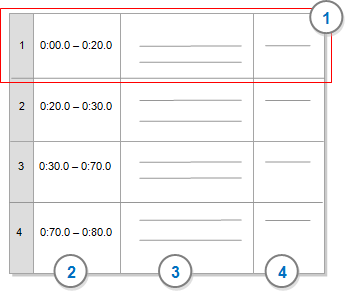 4 Custom columns (fields) that you can add to the transcripts in your project. They contain additional information that you might want to capture, such as speaker name. NOTE You may have a transcript without an accompanying audio or video file—for example, a text-based interview. You can import this type of transcript as a document file. Have your media files automatically transcribed with the integrated transcription service NVivo Transcription. The completed transcripts will be available within NVivo to import into your project. Click in the ID column of the row you want to delete. You can copy and paste a transcript entry within a transcript or across transcripts. You can also copy and paste a transcript entry into a document or memo. Click in the ID field of the transcript entry you want to copy. On the Home or Edit tab, in the Clipboard group, click Copy. Click in the required location for paste (for example, a document or video/audio transcript). On the Home or Edit tab, in the Clipboard group, click Paste. NOTE If you want to exclude the related information (coding, 'see also' links and annotations), click the arrow under Paste, and then click Paste Special. Do I need a transcript? Since you can code directly on the media timeline, you may not need a transcript. However, when you open a node, you will only see the timespan—for example, the timespan 0:20.0 - 0:50.0 is coded at the node conflict. Transcripts are useful if you want to include your audio or video files in Word Frequency or Text Search queries. You can leave the transcript blank or hide it if required.